Armadillos: cute or creepy? Whatever your thoughts are about the way they look, they can be a nuisance when they move in to your home or destroy your yard. 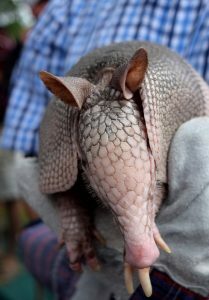 Why Do You Need Armadillo Removal? How Should You Handle the Process of Armadillo Removal? Some products are supposed to be able to repel armadillos. However, such products tend to be less reliable than their marketing makes them out to be. The most straightforward solution for armadillo removal is to catch them and then remove them from the premises. However, this is not something that homeowners should do without professional assistance. Need Help With Your Armadillo Problem? Those who need armadillo removal should contact Critter Control of Gainesville at their earliest convenience for further information on how our pest control and wildlife specialists can help with the immediate problems you are having as well as preventing further occurrences for maximum peace of mind.